practice with the 50mm 1.8......it is tiny! Off on a tangent - What breed of cat is it? Some people think photographing pets isn't such a big thing but have you ever actually seen a really terrible formal portrait of a cat that wasn't the result of some really bad work on someone part? I mean you practically have to photoshop a cat in some bizarre way to make that happen. I don't think I've ever met a truly ugly cat, have you? Cats are perfect subjects. They can move fast and unexpectedly but they also can stay remarkably still for periods of time and the poses they often sit in are artful. Portraits are all about the eyes, and when it comes to eyes it's hard to beat those of a cat for color and drama. I could and do photograph cats endlessly. They never get boring really. This is a lovely shot. I like the lines and the colors really compliment those gorgeous eyes. Nice capture. I love cats, have 4 of my own. Nice timing, pose, framing, lighting and color. I like the complimentary color of the wood behind. The only nit pick is the shallow depth of field, stopping down a bit would have gotten a little more dof and improved the image a bit I think. "Cats were once worshiped as gods and they have never forgotten this"
Nice photo! It's not easy to get a cat to hold still while you stick a camera in its face. 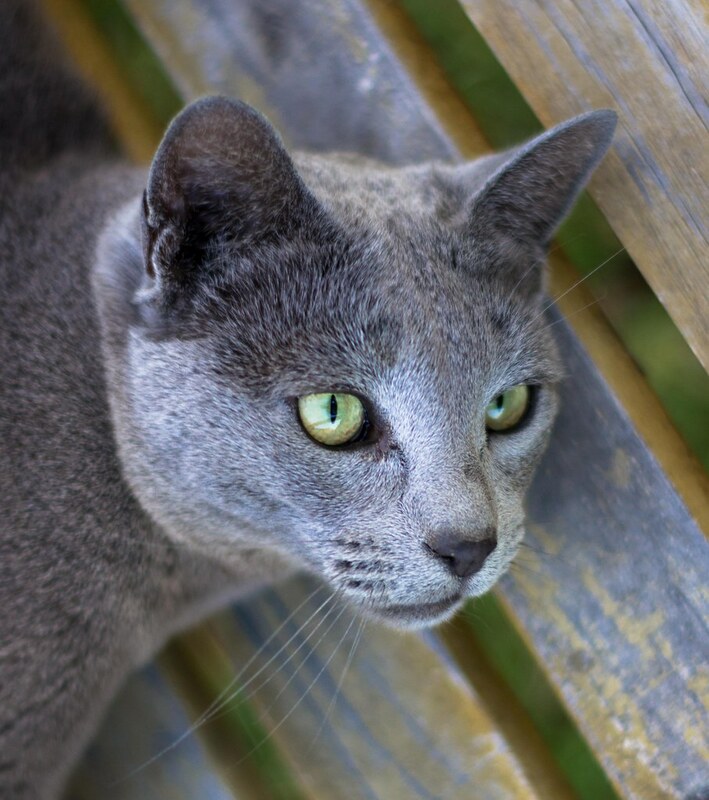 I love that picture of the Russian Blue. The background perfectly compliments the cat's coat color. I had a Russian Blue Kitty when I got out of college. She was one of the nicest cats I've owned but yours is prettier. Absolutely beautiful coat and color. Do you show RB's?